With mobile technology becoming the center of attention nowadays and the world turning wireless, Mobile Application Development is on rise. One of the key challenges of mobile application development is that a large number of platforms and devices are being introduced constantly. To meet the ever-growing challenges, GS TECKNO offers custom mobile application development services across a variety of platforms and devices. We have wide experience in Mobile Apps Development and have harnessed mobile technology for platforms like iOS, Android, Windows Mobile, Symbian and J2ME. 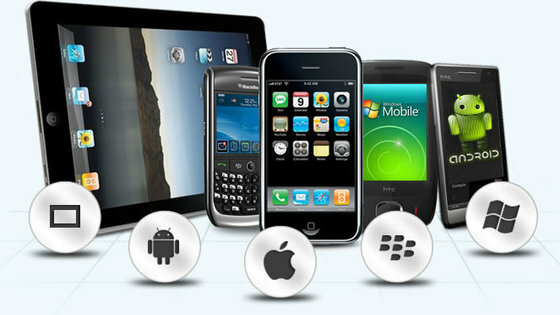 Our Professional Mobile App Developers are fully capable to develop any complex application that suits your needs. We focus to deliver high quality, cost-effective, time bound and value added services to meet a wide range of requirements in order to help clients yield greater return on investment for their mobile technology initiatives. iPad and iPhone devices have taken hold of the mobile computing market in a big way: user affinity is increasing and the number of apps in the Apple App Store is still growing at an impressive rate. iPhone and iPad users represent one of the largest segments of portable device users; iPad devotees dominate the tablet market. This is a great opportunity to engage your customers, get them involved, and make use of your employees’ mobile habits. We boast of an in-house team of proficient and skilled iPhone developers who have proven expertise in developing cutting-edge iPhone / iPad mobile apps. Administering pre-defined logical approach and best practices our developers render business-centric iPhone and iPad mobile apps that satisfy the ever-increasing demands of our customers. Android apps live in a highly fragmented multi-device world. Android is a leading OS for mobile devices and it is now confidently making its way into the tablet market. The API rules are less strict, but quality assurance testing is more intensive. From Gingerbread to Lollipop, simple phones to custom devices to Android wearables — we can do it all. We have a technically-sound team of Android experts that has best-in-class skills and proven expertise in mobile application development by using the Android platform. Our programmers are dedicatedly engrossed in developing scalable and highly robust android mobile applications and porting to distinct mobile platforms. Windows is now more than just the dominant force on the desktop market. First Microsoft put out feelers with its redesigned Windows Mobile platform and targeted consumers with the Metro UI in its first Windows Phone version. Now the company has entered the mobile space in a big way, totally reshaping its mobile strategy – Windows Phone 8 and the brand-new Windows 8 for tablets offer tons of exciting features under the hood.